Happy Thanksgiving from the Gynzy team! To help you and your students get into the spirit of the holiday, we have created a new lesson plan to use with your class! Our Thanksgiving lesson includes multiple activities and a quiz, and will teach students about the holiday’s origins; they’ll also learn what life was like for the Pilgrims and Native Americans alike. Teach your students the true meaning of Thanksgiving! Have you been searching for Thanksgiving lesson plans? Here is our new pre-made lesson plan. It is the perfect way to get your kids ready for Thursday’s festivities. It includes informative texts and a video about the holiday; as well as matching games, and activities for both creative writing and brainstorming. There’s even a Thanksgiving-themed Gynzy Game Show at the end to make sure your students were really paying attention! Click here to use this pre-made Thanksgiving lesson plan. In this lesson, students learn what life was like for the Pilgrims and Native Americans. They compare and contrast holidays, prioritize things they are thankful for and think of ways to show gratitude. Start your lesson with a short introduction on your smart board to teach your students what Thanksgiving actually stands for. 2. What was life like for the Pilgrims? Open this video below on your interactive whiteboard. This video shows students what life was like for the Pilgrims back in the 1600’s. Teach your students some new vocabulary with this short and fun game. 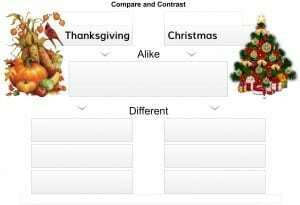 Do your students know the similarities and differences between Thanksgiving and Christmas? Start a discussion and let your students fill in the blanks. What are we actually thankful for? Start a short brainstorm session in your classroom. Let your students create a list, word spider or bubble map with things they are thankful for. 6. What was life like for the Native Americans? This video explains clearly what life was like for the Native Americans. This virtual field trip features Pilgrims and the Wampanoag tribe, discussing their lives, their collaboration, and the first Thanksgiving. Use this printable worksheet in order for your students to create their own plans to show gratitude. When they finished their plans, let your students present their ideas in front of class. Finish the lesson with a fun and educational game. This fun game helps to test student’s knowledge of Thanksgiving. Do you like these Thanksgiving lesson plan ideas? Click here to open the pre-made lesson.